Chen Liang and her husband, both in their early 30s, have no children, but allocating 1,000 yuan ($147) per month for their pet dog named Huahua has become a routine item in the family budget. Recent purchases for their beloved shiba inu include a foldable pet bed, dog clothes, smart pet feeders, and tailored grooming services. The couple constantly seek out increasingly eccentric gadgets to pamper their beloved companion. "She's an irreplaceable family member, bringing us so much joy. That's why we want to make her happy, too," Chen said. Chen is just one among the many pet owners who together generated overall spending of 170 billion yuan last year, according to goumin.com, a major Chinese online forum for pet owners. 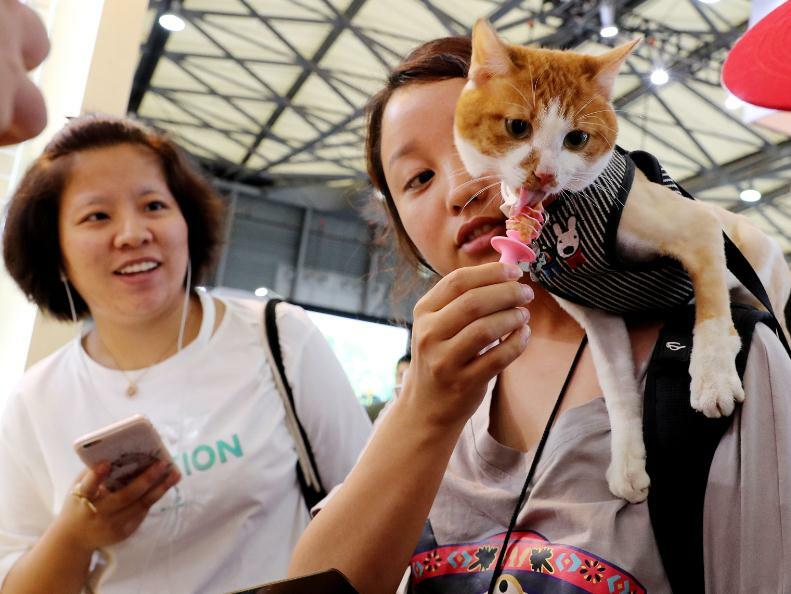 Pet-related services will see 20 percent annualized spending growth each year, with the total amount spent to hit 250 billion yuan by 2022, said Shenzhen, Guangdong province-based ASKCI Consulting in a recent report. Surging expenditure on pet care is a reflection of a broader shift in consumption habits among China's middle-income earners. Those who can afford more than the basic daily essentials are now buying services that enrich their lives. E-commerce giant JD's research arm, 21 JD Big Data Institute, found in a survey released earlier this month that service consumption is taking money fast via online channels. Avid spenders are typically residents in the nation's relatively affluent Yangtze River Delta region, which includes Shanghai and the neighboring Zhejiang, Jiangsu and Anhui provinces. The report identified two factors that contributed to this uptake trend: one based on physical goods such as car maintenance and housekeeping, and the other referring to products that are services in themselves, such as travel, pet care and insurance. For instance, customers from Shanghai, Suzhou in Jiangsu province and Hangzhou in Zhejiang province ranked the top three cities for auto repair expenses over the past two years. As for outbound travel, the number of international flight tickets booked by female users in Shanghai was 10 times higher than their peers in second and lower-tier cities, according to JD's data. Last year, total spending on travel-related services jumped 4.4 times among Yangtze River Delta residents year-on-year, with the number of flight and hotel bookings soaring 50 percent. Healthcare services reported similar trends, with spending on medical checkups, dental cleaning, cosmetic procedures and gene detection jumping 6.7 times in 2018 compared to the previous year. These numbers echoed predictions by the World Economic Forum and global consultancy Bain and Co, which projected that a massive number of industrial jobs would be redeployed to service sector jobs in China, as household income is forecast to increase by around 5 percent annually through to 2027. "Products are advancing from commodities to become part of an integrated consumer experience," said Bruno Lannes, a Bain partner based in Shanghai and co-author of the report on 10 emerging consumption trends in China. One of the policy directions of China's 13th Five-Year Plan (2016-20) promotes new consumption patterns, which includes expanding service consumption, encouraging the development of custom-made services to meet the growing demand for personalization, and advancing online and offline integration. Chinese consumers, who tend to be open-minded about innovative investment products, are willing to pay for premium and professional financial services, and are receptive to "spending future money", according to a survey conducted last year by the Hong Kong Trade Development Council. Nearly two-thirds of the survey respondents said that "pleasing themselves" and "wanting to experience better and more unique services" are the main reasons driving them to consume innovative or high-end services. Shoppers' predisposition toward new rollouts or exclusive offerings is paying out, too. Last year, Shanghai topped all other cities in terms of spending on new products, which was 3.9 times higher than the national average. Thanks to co-creations from brands and internet companies like Alibaba, which provide their data to distill the latest consumer insights, some 50 million new products from 200,000 local and foreign brands hit the market via Alibaba's Tmall site. "It's safe to say that consumers now increasingly seek out niche products as a reflection of their unique personality and pursuit for quality," said Jet Jing, president of Tmall, a major e-commerce platform of Alibaba. Lannes from Bain agreed, saying: "The best brands are determining how to integrate their products into the overall customer experience, which includes not only shopping, but learning about a product, using it and recommending it." Smart products and high-quality or tailored services prompt higher e-commerce expenditure among affluent netizens.